Team formed 1950. Original track was on old shale tennis courts. Local Council built a new track for the start of the 1951 season, this being used for the National Team & Individual Finals in 1952. 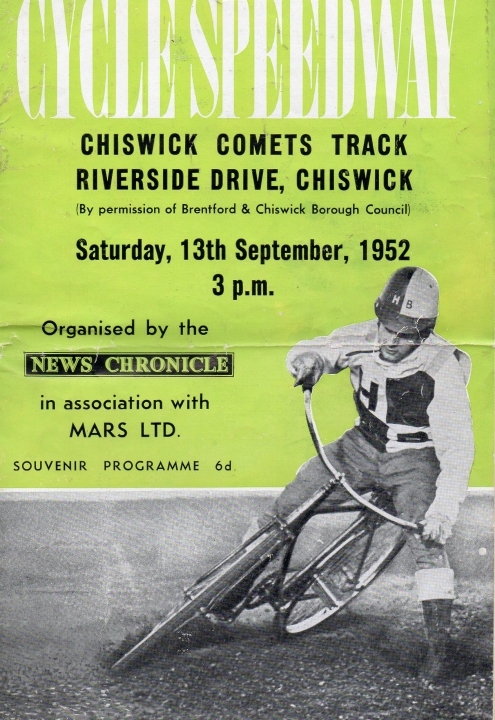 Track was in Riverside Drive, Chiswick. Team Captain: "Rocket" Ron Byford(1950-53). 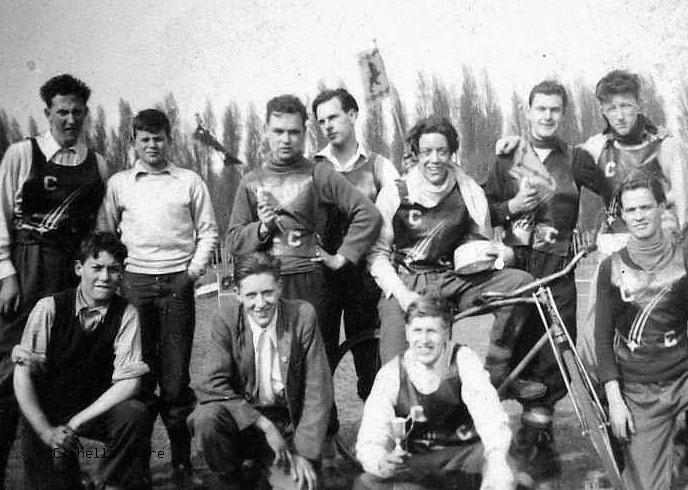 Club disbanded in 1956 due to lack of riders, several joining the services. The 1952 British Senior Individual Final was held at Dukes Meadow, Riverside Park, Chiswick. The Referee was Mr J. Bunker(Buckinghamshire). 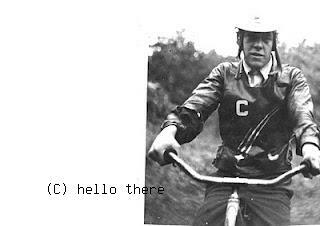 The winner was Rob Hunt(Walton-Surrey) who scored 14 points, runner-up was Les Perrett(Tuddenham-Norfolk), after a run-off with Gus Garrett(Verney-London S.E) who came 3rd, and Eric Cleaver(Rugby-Warks) who came 4th, all three riders having scored 11 points. Other Scorers: Ian Vintner(Kirby) 10, Brian Moston(Chorlton) 9, Brian Roberts(Southall) 9, Sonny Cattano(Black Lion) 8, Mal Ashworth(Pudsey) 8, Ken Worlock(Dings) 7, Alan Packham(Rose Hill) 6, Dennis McGee(Hyde) 5, Mick Fisher(Rodbourne) 4, Alan Mowatt(Highfield) 4, Doug Wootton(Whitby) 3, Dave Daw(Colebrook) 0. 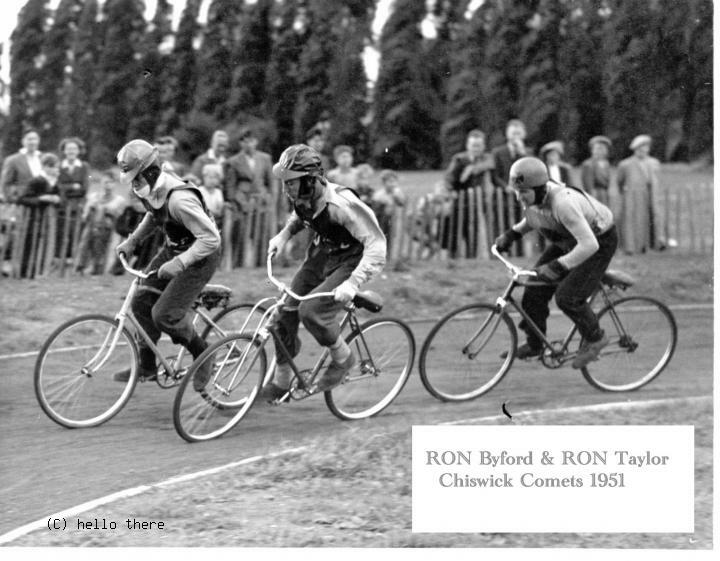 1951 "Rocket" Ron Byford & Ron Taylor.